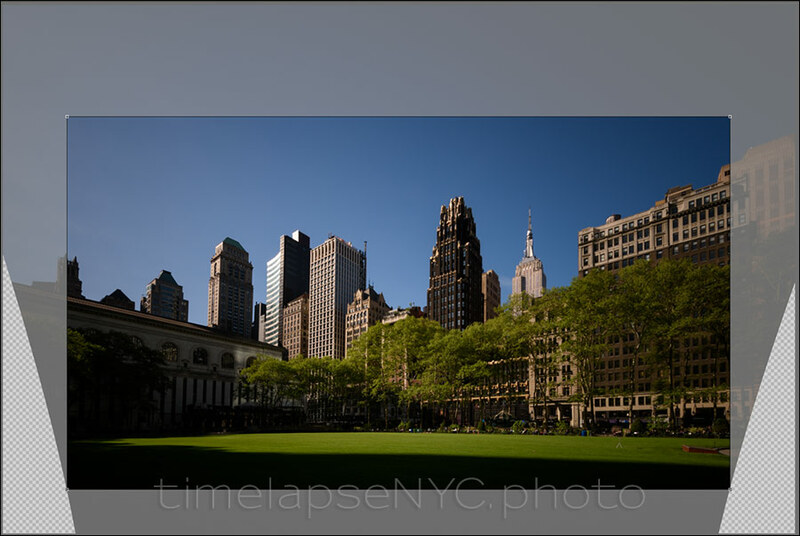 With the other Time-Lapse Photography projects shown here – which can be seen via the Projects drop-down menu – I showed some of the hardware that was used to create the time-lapse videos. Very often a new piece of camera gear is needed to help solve a problem and make sure the time-lapse video is do-able. With this specific time-lapse project, only one static camera was necessary. No multiple cameras, nor motion-controlled dollies. However, we still wanted to make it a dynamic video with movement. My client wanted the video to show the environment where their property end located – on 40th St, right next to Bryant Park. 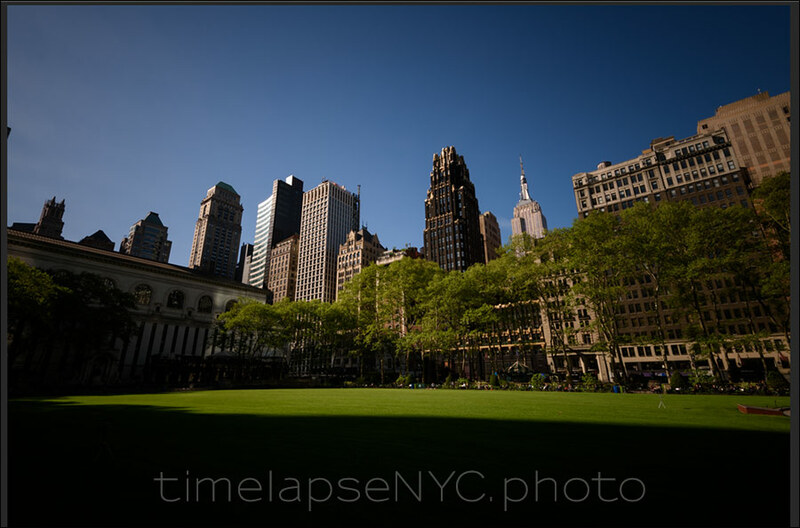 He wanted to show some of the busy-ness of New York, but that it also looked like it was right next to the green haven of Bryant Park. To make this happen, we decided to zoom in during the video. The final output would be the standard high-definition 1080p video. But we couldn’t just zoom into the video because we would lose a lot of resolution doing so! We had to keep everything looking crisp as the video continually zoomed in. And it is for this reason that I shoot time-lapse projects with high-resolution cameras. We need the detail as we zoom into the picture area, while still providing a high-quality time-lapse video. Here is the ultra-wide angle photo of the scene, with my client’s building slightly off-center in the middle of the photo here. Because we are using an ultra-wide angle lens and shooting upwards to capture the tall New York buildings, there is perspective distortion – it looks like all the buildings are leaning in. To make the buildings appear upright, and get rid of that perspective distortion, we fix all the frames we shot in post-production. We correct for the verticals, so that the buildings appear vertical, and not leaning in. This has the positive side-benefit of making the buildings appear appropriately larger in the frame. Then, continuing with the post-production software, we define this as the starting point – keep in mind that the resolution here is far more than that needed for 1080p or 4K video. Then we define the ending image in the software too. The ending image is a much tighter crop, revealing the property we want to highlight. Even in cropping so tightly, we still have more detail than 1080p or 4K high-definition video needs. And this is why this time-lapse video looks so good while the camera appears to zoom in continually – there is just that much detail in the footage we capture!